The Vans SK8-Hi Lite has a great-looking design. Its stylish appeal is appreciated by some of the purchasers. This stylish footwear is up for grabs at a budget-friendly pricing point. Many customers attested that it is a comfortable shoe, giving a lot of cushioning to its users. The Vans SK8-Hi Lite is amazingly lightweight, as testified by a significant number of wearers. Several buyers loved the shoe’s beautiful colorways. The sneaker is perfect for everyday wear, commented by a couple of users. A few of the reviewers noted that this shoe provides an ideal fit. Several disappointed reviewers stated that the dye is rubbing and transferring onto the laces. The shoe’s outsole does not provide a good grip, noted by some of the wearers. A few mentioned that the Vans SK8-Hi Lite is not durable enough for skating and BMXing. With a relatively slim design, the Vans SK8- Hi Lite is a perfect substitute of the classic if one wishes to have a more comfortable and lightweight footwear that can provide all-day comfort. It fits the bill for extended walking and traveling as it gives a fashion-forward appeal with uncompromising comfort. With a budget-friendly rate, this sneaker can be worn by men and women to match a variety of casual outfits. However, incoming buyers need to note that while it is an excellent use for extended walking or standing, it won’t hold long for extreme use such as skating. Paul and Jim Van Doren, together with Serge D’Elia and Gordon Lee, founded the Van Doren Company in Anaheim, California in March 1966. Initially, the company released the “Style#44” or also known as the “Authentic.” From then, a myriad of comfortable and stylish Vans shoes that would meet the performance needed by skateboarders, BMXers, and other athletes have been released. Vans also launched the “Style #36” aka the Old Skool which was intended to address the skateboarding’s wear and tear. However, the Old Skool wasn’t able to provide the ankle protection needed. Therefore, later on, Vans launched a skate shoe with a mid-top silhouette known as the “Style#37,” but still it wasn’t enough. Finally, the “Style#38” or also known as the SK8-Hi Pro was launched. It had a combination of leather and canvas uppers built on a high-top silhouette, providing reliable ankle protection and support. Inspired by the “Style#38”, the Vans SK8-Hi Lite has a re-engineered silhouette built with a modern construction to provide an improved fit and increased comfort. It still maintains the aesthetic of the classic Sk8-Hi but with a reduced overall weight, keeping the foot more relax and comfortable. With a streamlined design, this sneaker can be comfortably worn by ladies and gentlemen and paired with a variety of casual clothing. The shoe also fits the bill for standing or walking all day. With almost 40 years of participating actively in fashion and sports scenes, the Vans Sk8-Hi silhouette has maintained its presence in the sneaker market. It has been updated and improved as well as utilized in over 100 collaborative works. Some of the known celebrities, retailers and companies that had partnered with Vans and rework this silhouette are Niagara, Thrasher, Supreme, Disney, Marc Jacobs, Mastermind Japan, Footpatrol, Taka Hayashi, Bows and Arrows, Noah, WTAPS, NASA, Marvel, Off-White and Bones Bridges. 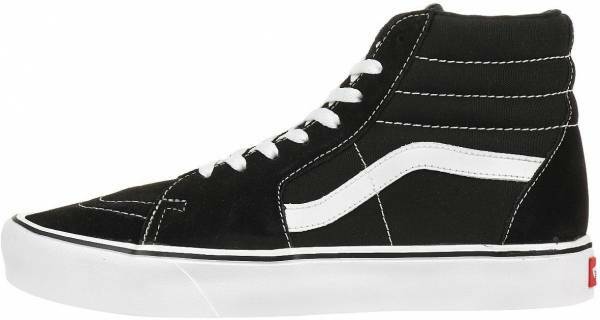 With a unisex style, the Vans SK8-Hi Lite has a high-top silhouette that gives adequate ankle support and protection. It has triple stitching on the collar while the Vans Sidestripe emblem on the side utilizes a leather material. This unisex sneaker, which is lighter and slimmer than the classic version, has a straightforward design but can match a variety of outfits. It has colorways available including Port Royal/True White and Black/White. Men and women can stylishly rock their Vans SK8-Hi Lite shoes with joggers and a shirt, as well as an optional jersey, for a comfortable feel with a sporty vibe. The Vans SK8-Hi Lite skating shoes, when paired with slim-fitted and distressed jeans and topped with a plain shirt, can result in a laidback look. Ladies can also wear this unisex sneaker and match it with dresses for a more stylish appeal combined with a feminine touch. The Vans SK8-Hi Lite for women looks perfectly great when paired with a leather skirt, providing comfort and a chic look. Women can wear their pair of high-top sneakers and comfortably rock them with a summer dress for a simple casual look on a nice warm day. Without any fuss, women can rock their Van SK8-Hi Lite shoes a black shirt, an oversized jacket and ripped denim shorts. For a more formal appeal, ladies can match their tights with their white pair of high-top sneakers. Men may wear their black Vans SK8-Hi Lite shoes with all-white ensembles such as white denim jeans and a white plain shirt, providing a contemporary and straightforward look. A pair of high-top shoes like the Vans SK8-Hi can help achieve a sophisticated look when old or young men match it with above-ankle cuffed denim pants along with a plain shirt and a grey suit. Boys can wear skinny jeans that are also rolled-up above the ankle to match their high-top sneakers. They may pair them with a plain shirt and a jersey for a casual look with a bit of a sporty vibe. If men want to have a cozy yet stylish outfit on a nice sunny day, they may wear a camouflage knee-length short together with a graphic or plain shirt to match with a pair of Vans SK8-Hi Lite shoes. The Vans SK8-Hi Lite is available in men’s sizing from 3.5 to 13 US, but if ladies want to grab a pair, then they just need to pick 1.5 sizes down than their usual since the foot measurement was taken from the men’s sizing. The shoe fits true to size. It has a lace-up closure that allows an adjustable fit and secured lockdown. This lace-up sneaker features a combination of 170 grams canvas and cow suede uppers that offer adequate ventilation. For all-day comfort, it has heel cushioning, padded collar and cushioned footbed. It has flexible midsole and rubber outsole, providing support and a sure-footed grip. With the Vans SK8-Hi Lite, you can forget that you are wearing a shoe because it is so lightweight. It has the Ultra Cush Lite sock liners that ensure long-lasting comfort. The Ultra Cush technology not only provides improved comfort but also increased flexibility. This lace-up sneaker also utilizes the Actionfit technology which provides a higher heel height, creating a more balanced feel in every stride. Another variation of the Vans SK8-Hi Lite has an upper of an all-canvas material with colorways including Black/Black, True White, and True White/True White. A checkerboard-patterned designed upper is also available. For support and superior durability, the Reinforced Duracap toe bumper, as well as upper Ollie underlays, are installed. The heel height measures one inch. It has a circumference of 8 inches. The shaft measures 4.5 inches.